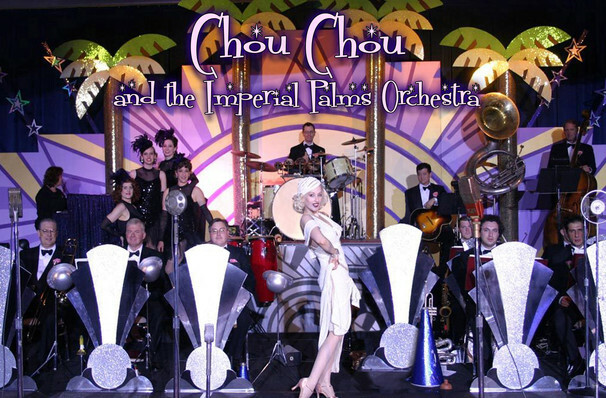 Why See Chou Chou and The Imperial Palms Orchestra? Prepare to be dazzled by the wonderful Chou Chou and The Imperial Palms Orchestra as they turn back time with this unmissable exploration of four decades of Jazz. A full-length show, you'll be treated to a spectacular of singing, music, dancing and more as Chou Chou and friends the Coconut Dancers, Baron Tomcat, James Anthony and Johnny (Chops) Colianni re-create the golden age of the genre in a nostalgic celebration that'll have your toes tapping from the first bars! Featuring glorious sets and glittering costumes, expect a lot of love, laughs and joy when this exciting new extravaganza from Love It Productions lights up the Lisner Auditorium this spring! Sound good to you? 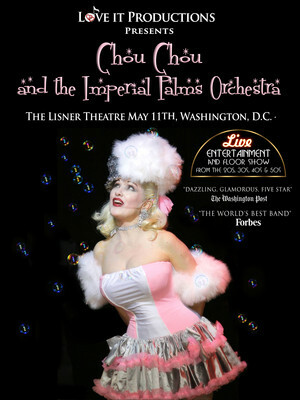 Share this page on social media and let your friends know about Chou Chou and The Imperial Palms Orchestra at Lisner Auditorium. Please note: The term Lisner Auditorium and/or Chou Chou and The Imperial Palms Orchestra as well as all associated graphics, logos, and/or other trademarks, tradenames or copyrights are the property of the Lisner Auditorium and/or Chou Chou and The Imperial Palms Orchestra and are used herein for factual descriptive purposes only. We are in no way associated with or authorized by the Lisner Auditorium and/or Chou Chou and The Imperial Palms Orchestra and neither that entity nor any of its affiliates have licensed or endorsed us to sell tickets, goods and or services in conjunction with their events.